Aside from the intensified feeling of passion in the air, there seems to be an influx in the purchase of saccharine and spirits whenever the day of hearts is fast approaching, and why not? Chocolates and wines are proven to be good for the heart, throw in a romantic atmosphere—plus a selection of savory dishes—and you can never go wrong this season. This Valentine’s Day, delight your loved one with a sensorial feast in an oasis of verdant greens, set against the vibrant cityscape. Let your souls be entwined with the soothing melodies of jazz while you allow your taste buds to rejoice with every bite of the flavorful dishes. Palazzo Verde offers all these and more on the most special day especially designed for lovers. Tucked within the progressive district of Vista Alabang in Daang Reyna, Palazzo Verde is undeniably the most romantic events venue in the metropolis. Encompassing more than 10 hectares of vibrant greens, it provides the perfect setting for the most romantic moments. Apart from the magical weddings and unions, Palazzo Verde is also becoming the top choice for other life’s milestones. 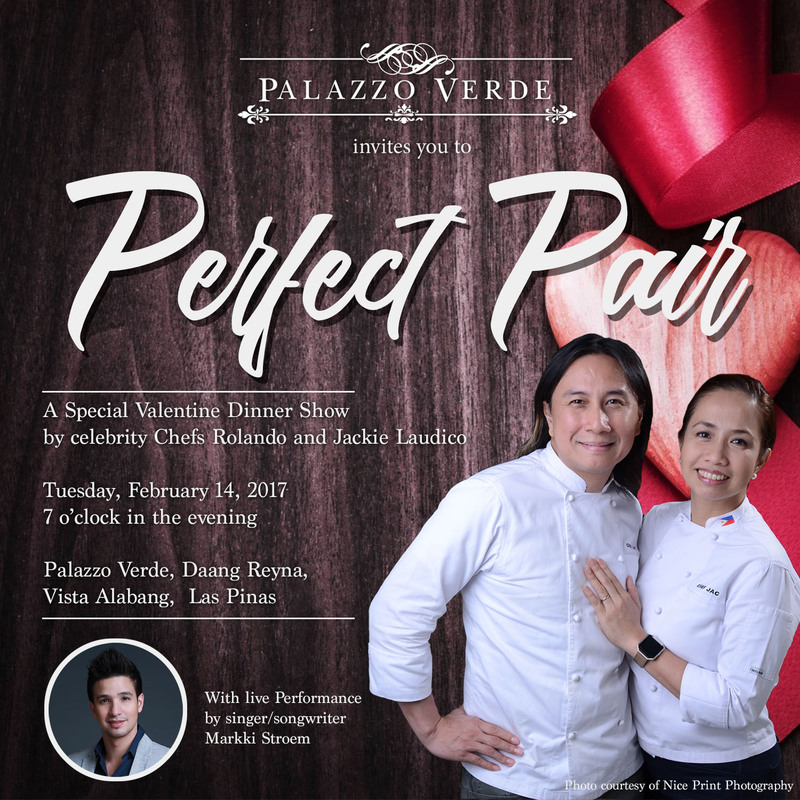 Yet, with all these recognitions, Palazzo Verde does not rest on its laurels, and still pushes the envelope further by launching a special set of offerings to make your Valentine’s celebration even more memorable. The five-course set menu prepared by celebrity chefs Roland and Jackie Laudico is a fusion of distinct Filipino flavors made global with a European twist. It starts off with Sinuglaw Pairing of fresh Tuna seared to perfection and Grilled Pork Belly, drizzled with Spicy Roasted Capsicum Sauce, Cilantro Oil, and Calamansi Pearl. This robust, yet light opener incredibly fuses together rich flavor profiles to excite the palate. Soup and Salad, an ingenious take on the Filipino favorite Sinigang features Shrimp and Radish Salad tossed in Tamarind Miso Dressing on Gabi Croquette with a side serving of hot Miso Sinigang Broth. The bounty of the seas continues with the Pasta Course of Linguini made festive with Crab Roe Sauce and Calamari, and Spaghetti Tuyonesca drizzled with Malunggay Basil Pesto. For the main course is Two Bisteks, made from Slow Roasted Angus Beef and Grilled Pacific Black Cod in Bistek Tagalog Pepper Sauce, served with Roasted vegetables and Sweet Potato Puree. It is an exciting new entrée and presents an impeccable play on various flavor profiles and contrasting textures. Cap off the hearty meal with a decadent serving of Chocolate Lovers. The dessert course is made from Tablea Molten Chocolate Kiss with Salted Caramel and White Chocolate Raspberry Crème Brulee. Celebrating the occasion in the true romantic Italian spirit, diners will also be treated to a musical number courtesy of one of the country’s famous crooners, Markki Stroem. Experience an inspired night that takes after the Italians’ affinity for great-tasting food and their grand gestures in declaring their affection. Palazzo Verde puts everything together that matters in one place, so all you have to do is profess your feelings to make the night complete. Avail the Palazzo Verde Valentine’s menu through special deals in MetroDeal for only Php 3,000 per couple, and Php2,499 per person, inclusive of all applicable taxes. Reservation is required upon purchase of the voucher. Vouchers are also transferrable. Dinner starts at 7pm. For table reservations, contact (917) 870 3838 or email <info@palazzoverde.com.ph>. Palazzo Verde is located at Daang Reyna, Vista Alabang, Las Piñas City. For more information, visit <palazzoverde.com.ph>.